Surprise!!! I think this is my quickest Cheesepalooza Challenge post I have done by far. Maybe I should have made my posting speed a New Year’s Resolution. It was pretty much a no brainer that I would make Asiago for the challenge, as this cheese is a favourite of both my wife Lorrie and myself. We have also eaten other cheeses that contain black peppercorns in the cheese and found these enjoyable. For the non-Cheesepalooza’ers, Asiago was/is a cow’s milk cheese produced in northern Italy near the town of Asiago in the Veneto region. 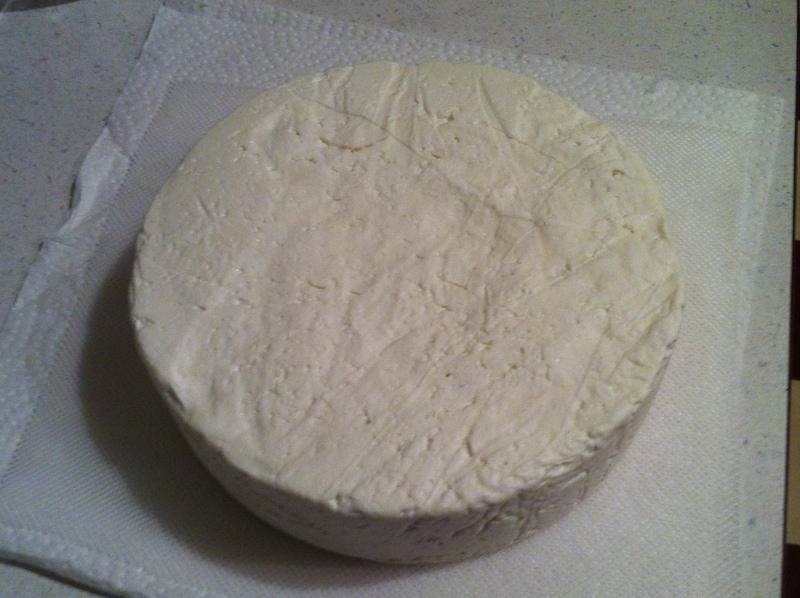 Production has been expanded and like other cheeses and copies are also made in other locations. But true Asiago is a Denominazione di Origine Protetta or DOP protected cheese made from cows milk in specific alpine valleys. Asiago can be enjoyed at a variety of ages and textures. Young or fresh Asiago is smooth and fresh and is known as Asiago Pressato. Older aged Asiago known as Asiago d’Allevo is crumbly and stronger flavoured similar to Parmesan. A variation, Asiago Pepato has black peppercorns integrated into the curds before pressing. On to the make. For this challenge I used Mary Karlin’s recipe but made a few variations. 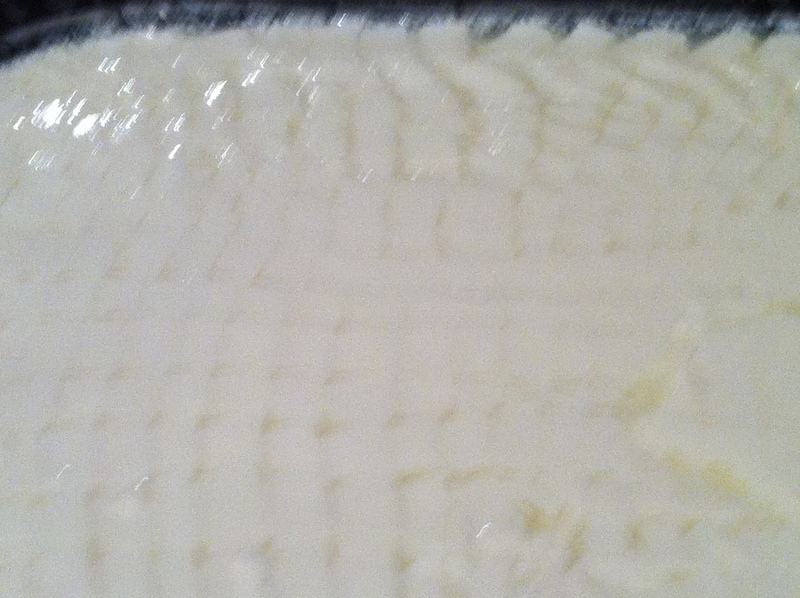 Mary’s recipe uses 6 quarts of whole milk and 2 quarts of 2% for a total cream content of 2.94%. According to Gianaclis Caldwell, Asiago is typically made with partly skimmed milk with an average 2 to 2.8% milk fat. I decided to go with 12 litres of 3.25% and 2 litres of 2% milk, which should give me a final cream content of 3.07%, which is a little high, but we do like cream in this family! As the milk volume I used was 1.75x greater than the recipe called for I decided to add slightly less than 1 teaspoon of Thermophilic B, Calcium Chloride, and Rennet. The original recipe called for ½ teaspoon of each of these ingredients. I once again had temperature control issues but this time I was too conservative. It took 70 minutes to reach 104 degF instead of 40 minutes. 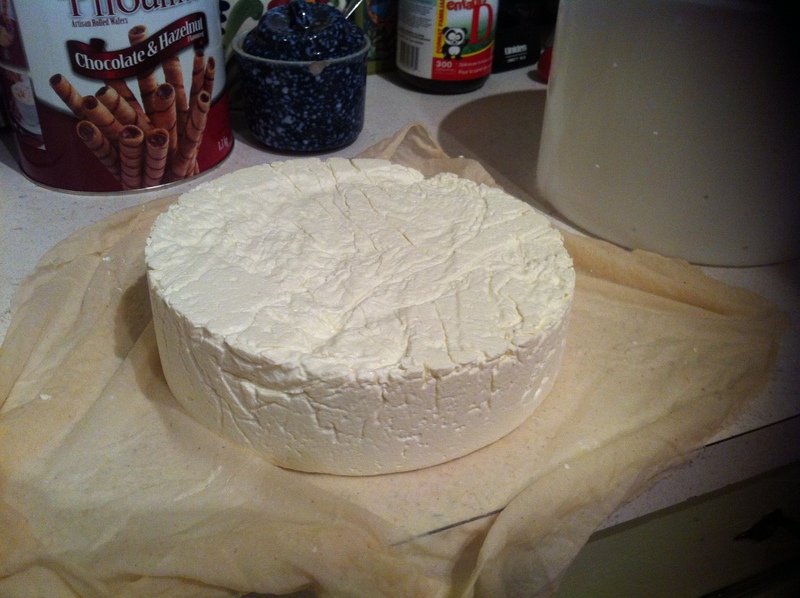 The curds turned out well and I got a good clean break. During the stirring phase the temperature rose to 123 degF instead of 118 deF. I did manage to maintain the temperature during the settling period at 120 degF. I then drained off the whey to expose the curds and placed the curds into cheesecloth lined St. Paulin/Tome mold (200 mm x 150 mm) and Reblochon molds (135 mm x 65 mm). I filled the Reblochon mold half full and then sprinkled black peppercorns across the top. Once the mold were full I pressed them with 8 pounds for one hour and then unmolded and unwrapped them, flipped them rewrapped them and placed them back in the molds. 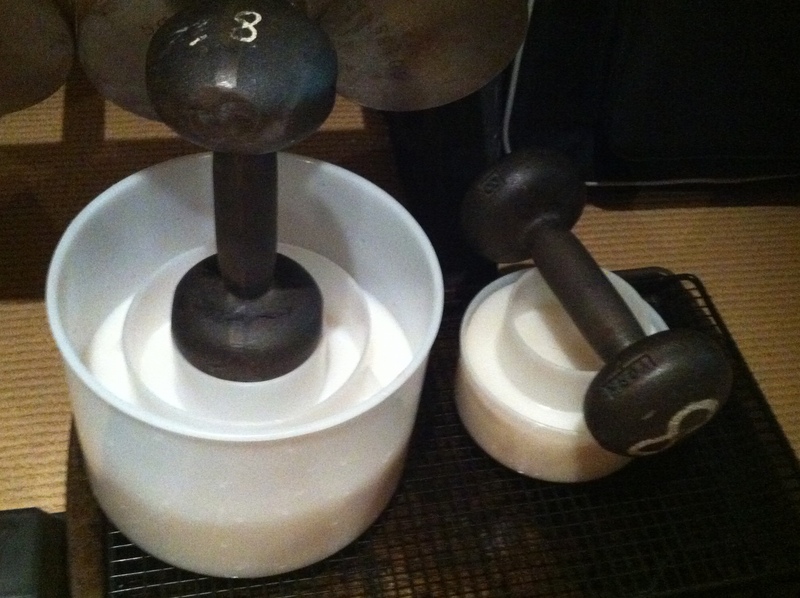 I then pressed them overnight or about 14 hrs with 8 pounds again. Mary had suggested pressing for 8 hours. 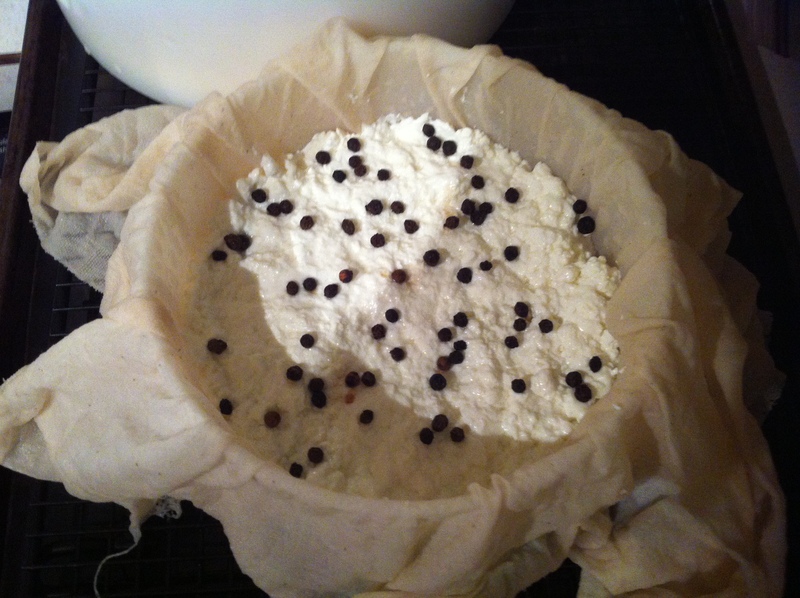 Remove the cheese from the molds and cheesecloth. 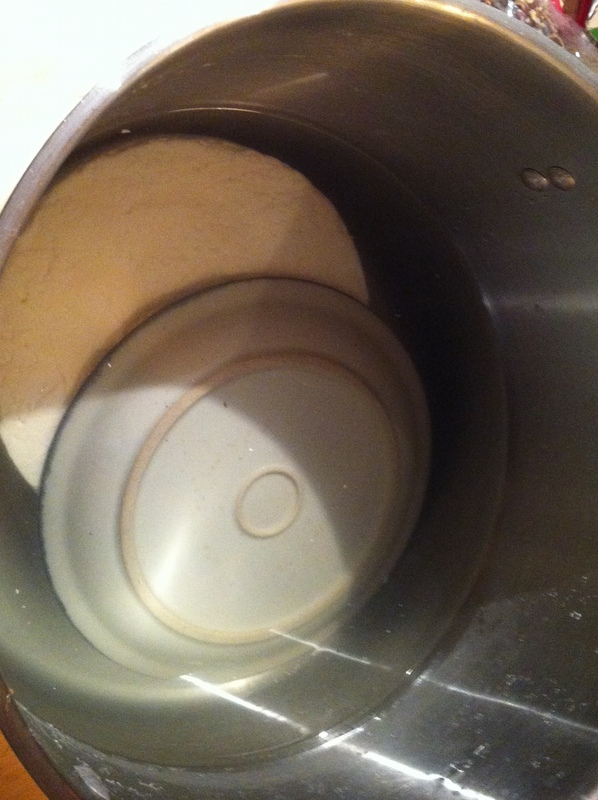 The cheese wheels must now be placed in Saturated Brine. I made my brine with 33 ounces of non-iodized salt, a quarter cup of Calcium Chloride and 4 litres of water that I had boiled on the stove. The Calcium Chloride is added so that the brine does not rob Calcium Chloride from the cheese (the concentrations want to equalize between the cheese and the brine). Some of the Cheesepalooza folks had their Feta turn gelatinous due to this transfer of Calcium Chloride from their cheese to the brine. The cheese is brined for a period of time determined by the weight of the wheel (12 hours per pound of cheese). 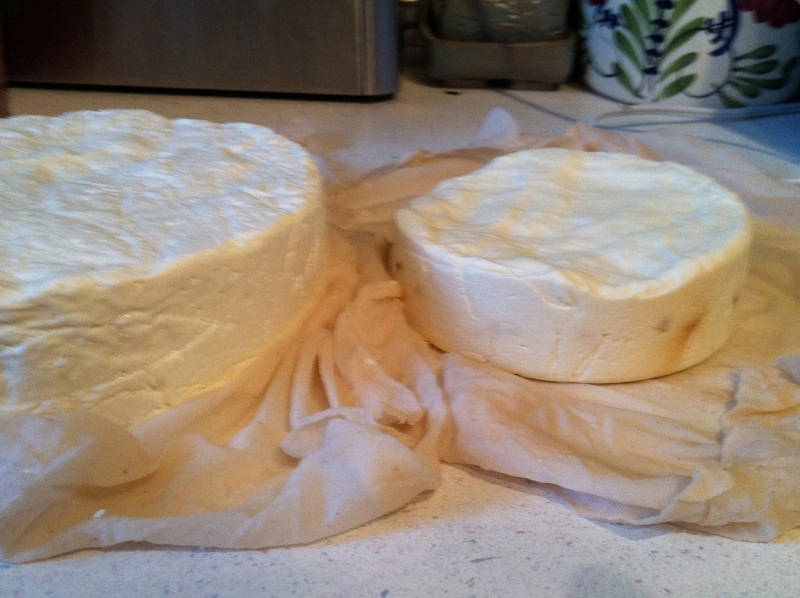 My Tome molded cheese weighed in at 3.54 pounds and the Reblochon molded cheese weighed in at 1.22 pounds. 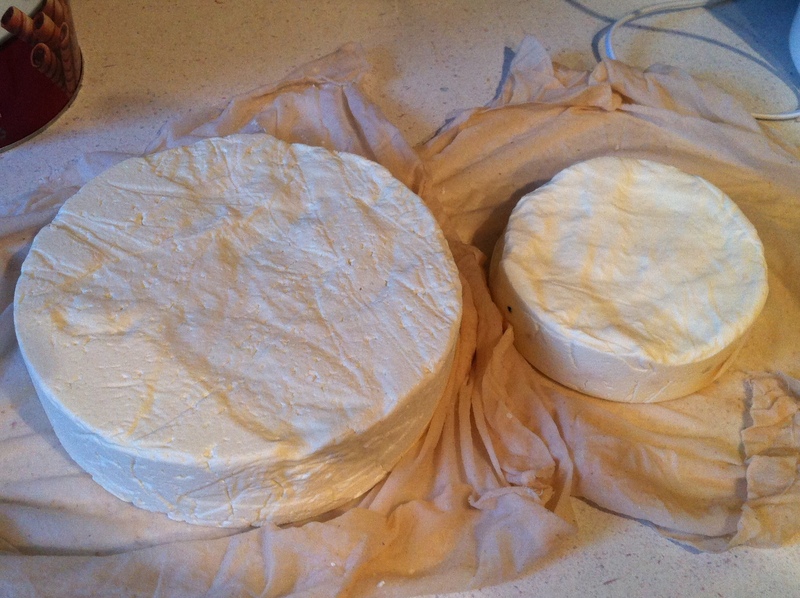 Thus the Tome cheese required 42.5 hours of brining and the Reblochon cheese required 14.5 hours of brining. I brined the smaller wheel for the full 14.5 hours but pulled the large wheel 4 hours early, as I didn’t want to get up at 3 am. My brine was also warmer as I didn’t have access to a 50 degF location that could hold my brine pot so I ended up brining at room temperature. 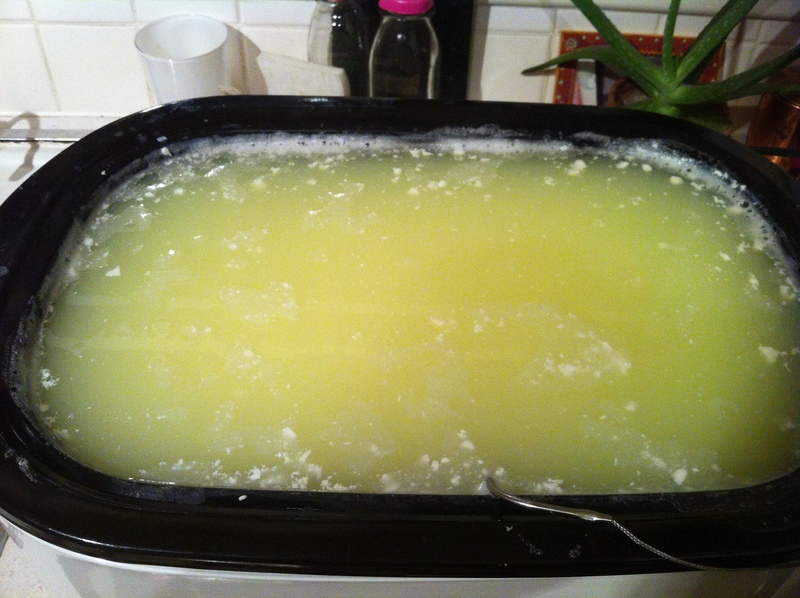 Once brining is completed, blot the cheese dry and place in the cheese cave. Aging can range from a few weeks for Asiago Pressato to up to a year for Asiago d’Allevo. The smaller wheel is Asiago Pepato (added peppercorns) so I will probably sample that one first and leave the larger wheel for up to 6 months or so depending on how the cheese performs in the cave. For this cheese make I have a couple of concerns. 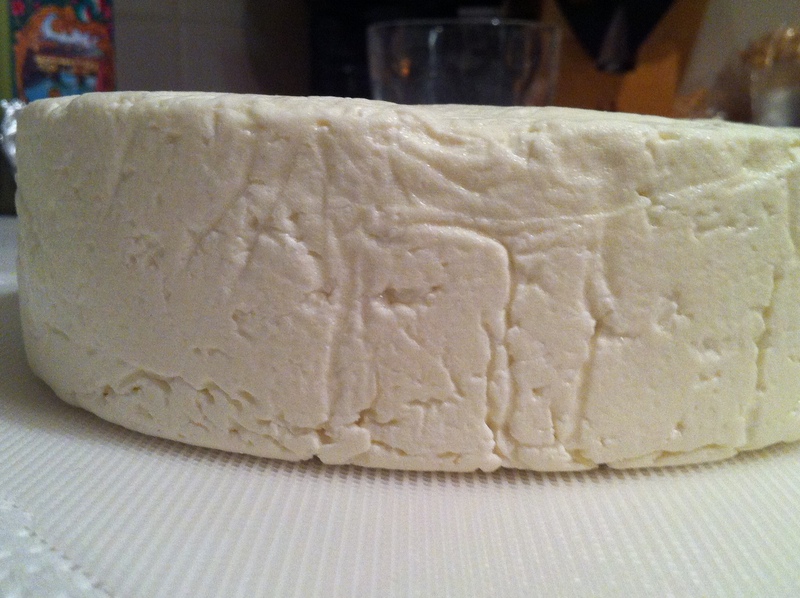 I brined the cheese at room temperature; I am concerned the salt uptake will have been too quick and by leaving my cheeses brine for virtually the recommended time for 50 degF they will be overly salty even for Asiago. My second concern is that I didn’t press with enough weight. 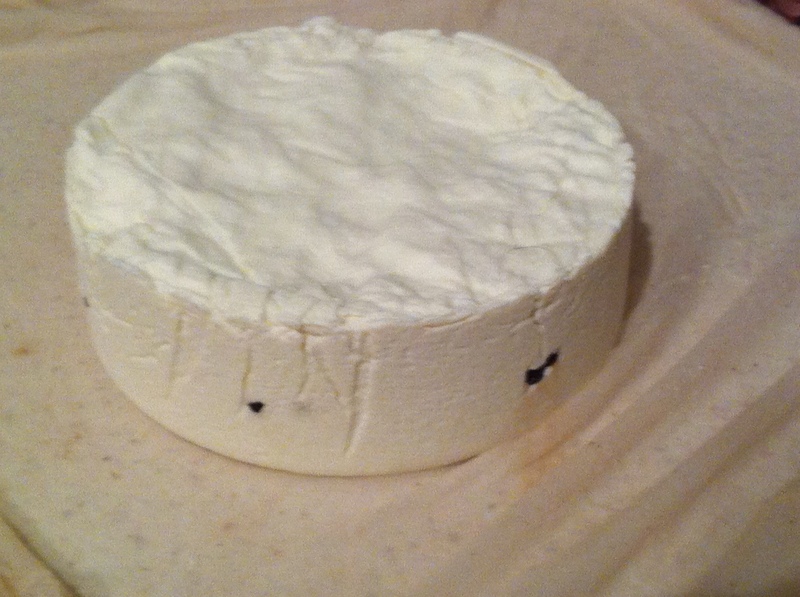 While the cheeses were brining (after pressing was complete) Ian tweeted to the Cheesepalooza group that the press weight is partly determined by the diameter of the cheese hoop (mold). I increased the milk volume and used my big Tome mold with the additional curd but I pressed at the recommended weight and time for the smaller sized mold so I am concerned I may not have expelled all of the whey. I will keep you posted when I finally break into these cheeses. So get out there and eat some handcrafted cheese! Your regional creamery will thank you. Nice, I hope they turn out well for you.